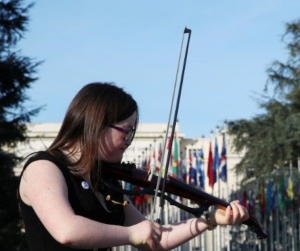 Artists with Down Syndrome in front of the United Nations building in Geneva (March 21,2019). In Geneva, the Twenty-First Session of the Committee for the Rights of People with Disabilities, was held (March 11-April 5, 2019). On a bright sunny day (March 21, 2019), the site of the United Nations in Geneva was “invaded” by groups of children and teenagers (and the persons who accompanied them) who had gone there to express their joy in living and (despite their situation) to give witness to that joy. Several young people spontaneously performed various musical works. Why such a day? This day is set aside in an attempt to change the manner in which people with Down Syndrome are viewed … to transform this difference (which often distances these persons from the normal activities of society: school, higher education, etc.) into a richness/a gift. More specifically, this celebration is intended to raise public awareness about this disability, to defend the rights of those individuals who have Down Syndrome and with “a chromosome of extra love” to affirm the inclusion of these persons in our midst. The objective is to inform people about this illness (often misunderstood and therefore every year responsible for many abortions). At the Fortieth Session of the Commission on Human Rights the following resolution was approved: A/HRC/40/L.20/Rev.1 – Rights of the child: empowering children with disabilities for the enjoyment of their human rights, including through inclusive education. It was also decided that the next meeting of this group would discuss the theme: Achieving the rights of children through a healthy environment. In recent years, Sister Monique, DC (a member of the Company of the Daughters of Charity) and Marie-François Salesiani-Payet (a member of the Society of Saint Vincent de Paul) have been regular participants in conferences that are organized around this theme by the United Nations and by the Non-Governmental Agencies of the United Nations. In 2018, these individuals, together with Julien Spiewak (also a member of the Society of Saint Vincent de Paul) supported a parallel event that was organized by the Apostolic Nunciature and the Lejeune Foundation (France). The date, March 21st, was not chosen by chance. The number “21” refers to the name of the disease (Trisomy 21), the “3” (March) refers to the presence of the third chromosome. It was the French Trisomy 21 Research Association (l’Association Française pour la Recherche sur la Trisomie 21), which was created in 1990 and chose this date in 2005.